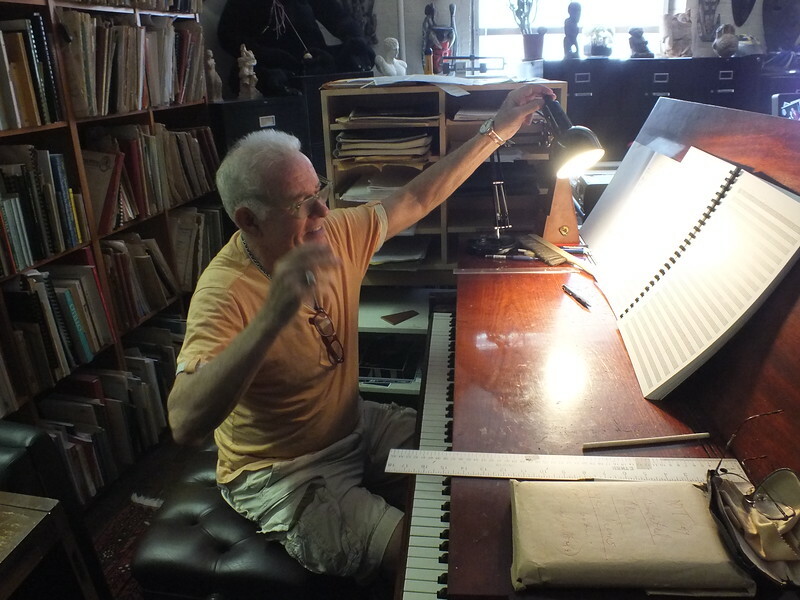 Intimate pictures of composer David Del Tredici composing on the piano. In 1964, Del Tredici met Aaron Copland at Tanglewood; they would be friends for the remainder of Copland's life, and his musical style remains an influence on Del Tredici. Del Tredici taught at Harvard University, where he worked alongside Leon Kirchner, and was a part of the modernism movement. He has stated that "anything bad appeals to any young composer", including himself. Much of Del Tredici's work has been inspired by literature, including author and poet James Joyce. As a fellow lapsed Catholic, Del Tredici was attracted to Joyce's struggles with his own Catholic past and "tortured life", which found voice in Del Tredici's "dissonant and nearly atonal" style. He also found inspiration in Martin Gardner's The Annotated Alice and its commentary on the works of Lewis Carroll. During this period, he found himself moving back towards tonality, which he felt was more appropriate for works such as his Final Alice and Adventures Underground. Del Tredici was Composer-In-Residence at the New York Philharmonic from 1988 until 1990. In 1999 and 2000 he taught at Yale University. He also has taught at Boston University, Juilliard School, and the University of Buffalo. As of 2013, he was a faculty member of the City College of New York. Today, Del Tredici continues to draw on literature for his song cycles. His work has continued to draw on Lewis Carroll (particularly Alice in Wonderland), but he has also been inspired by contemporary American poets. He has also created works celebrating "gayness", acknowledging that many great composers were gay and that "it's something to be celebrated". A reviewer has noted that themes in his work examine "tormented relationships, personal transformations, and the joys and sorrows of gay life". He is a member of the American Academy of Arts and Letters and has held additional residencies at Yaddo, the Virginia Center for the Creative Arts, and the MacDowell Colony.